An exterminator prepares to use a heat treatment at a San Francisco apartment infested with bed bugs. Cincinnati created a Bedbug Remediation Commission in 2007 and, like other local and national governments around the world, the city is trying to mobilize strategies to control infestations of the resilient insects, which can hide in almost any crack or crevice and can go a year or more without eating. On Aug. 10, the U.S. Environmental Protection Agency (EPA) issued a consumer alert about off-label bedbug treatments, warning in particular of the dangers of using outdoor pesticides in homes. The Ohio Department of Agriculture has mounted a more unusual response to the crisis: it petitioned the EPA for an exemption to allow in-home use of propoxur, a pesticide and neurotoxin banned in the 1990s out of concern for its effects on children. Although the EPA rejected Ohio's propoxur plea in June, the agency has scheduled an Aug. 18 meeting with state and municipal leaders to try to formulate an abatement strategy everyone can live with. Among the meeting's participants: representatives from the Centers for Disease Control and Prevention and, no joke, the Department of Defense. "We are hopeful that the outcome of this meeting provides a solution," says Ohio agriculture secretary Robert Boggs. "Quite frankly, something needs to happen, and it needs to happen quickly." Bedbugs don't transmit disease, but they can be harmful to mental health, as many Ohioans can attest. Nearly eradicated for the past half-century in the industrialized world, Cimex lectularis (the second word stems from the Latin for small bed) is presenting a 21st century environmental challenge. In the Mad Men days of pest control, "you could go down to the local drugstore, buy a DDT bug bomb, and everybody could slay their own bedbugs," says Michael F. Potter, a University of Kentucky entomologist who spends hours pouring poisons on bedbugs in his lab, seeking the elusive potion that kills them without harming humans or pets. The bugs developed a resistance to DDT decades ago, but propoxur can still kill adult bedbugs within 24 hours and keeps killing newborns as they hatch. The EPA banned it for in-home use in the 1990s on the basis of animal tests and ill effects on adult workers who were exposed to it. "We believe the window between a safe dose and a dangerous dose for a toddler is very small," says EPA pesticide chief Steven Bradbury. But before we join Ohioans and hit the streets with "Spray, baby, spray" placards, it's worth noting that scientists don't agree on whether a silver-bullet pesticide exists. "Propoxur might work for a few years, but then we would select for the genetically resistant bedbugs, and they would be right back," says Dini Miller, an entomologist at Virginia Tech and the state's urban-pest-management specialist. That leaves behavioral lines of defense as the most durable strategies. Dogs have been trained to sniff out bedbugs, and specialized pest companies can haul in machines that heat entire rooms to well north of 113°F (45°C), at which point the bugs die. Heat treatments cost thousands of dollars per room, but the lower-cost alternative of simply throwing out your infested mattress or furniture likely won't solve the problem  and may spread it to your salvaging neighbor. For home infestations, the EPA recommends reducing clutter, sealing cracks and crevices, vacuuming often, drying infested clothes at high heat and using a special mattress cover so you can sleep tight without letting the bedbugs bite. Travelers should inspect hotel mattresses, box springs and headboards for the pests and the inklike streaks of their droppings. In other words, a dose of vigilance  if not outright paranoia  is the best preventive. "We are looking at what we did a hundred years ago," says entomologist Miller. "We need to develop an individual consciousness, like we had then. You should think twice about leaving your purse on a seat in the movie theater and storing your kids' college furniture in the basement when they come home. 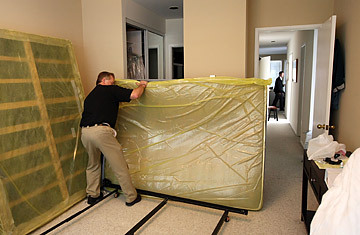 We need to be conscious that anybody from a group-living situation may come back with bedbugs."